Surging demand for high performance and lightweight insulation materials is driving the market growth. Advancement in technology leading to a reduction in composite material price is further boosting the market growth. Rise in per capita income, growing air travelers and hike in aircraft deliveries is again contributing the market growth. Also, the use of advanced insulating materials to reduce fleet weight & thermal conductivity by ensuring passenger safety is propelling the market demand across military and commercial aircraft. The latest report by Value Market Research expects the Global Aircraft Insulation Material Market was valued USD 7.4 billion in 2018 and is likely to reach at USD 11.2 billion by 2025 with CAGR of 6%. Thermal insulation material led the segment by accounting major market share in 2018. Thermal insulating materials offers sound and noise damping along with excellent heat-shielding effect is driving the segment market. Rising usage of thermal insulation materials provide more comfort and safety to the passengers onboard owing to its low thermal conductivity is further boosting the segment growth. In 2018, civil aviation emerged as the leading application segment. Growing middle class population, rising disposable income resulting into increase in air travelers is driving the segment growth. Growing iteration of low cost carrier aircrafts and an increase in spending by government to build better aviation infrastructure to connect secondary cities is further boosting the segment growth. Geographically, North America led the regional market in 2018. Huge spending on military and defense aircrafts is driving the regional market growth. Also, the presence of major industry players such as DuPont, Esterline Technologies Corporation, Triumph Group Inc. and others is further boosting the market growth. BASF SE, Dupont, Esterline Technologies Corporation, Evonik Industries, Rogers Corporation, Triumph Group Inc., Zodiac Aerospace and Zotefoams are some of the major players of the aircraft insulation material market. 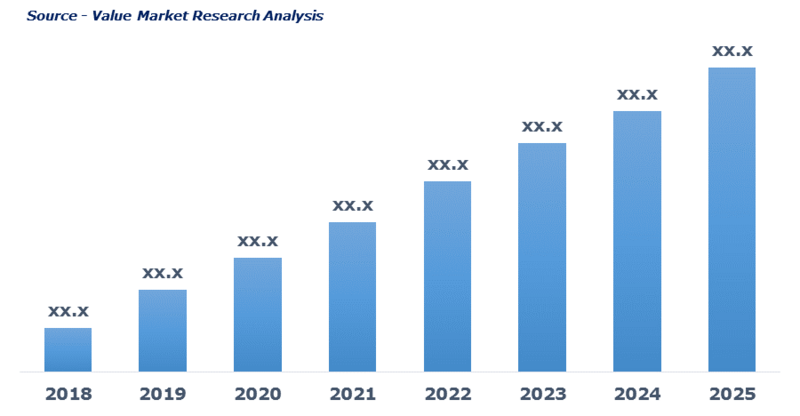 As per this study the Global Aircraft Insulation Material Market was valued USD 7.4 BN (by revenue) in 2018 and is anticipated to reach USD 11.2 BN by 2025 with a CAGR of 6%. Aircraft insulation material offers excellent fire, thermal, electric and acoustical insulation that improves fuel efficiency and passenger comfort. These materials fill spaces between fuselage and interior wall of aircraft and thus reduce noise levels and offer resistance to sound vibration. Rising demand for high performance insulation material for commercial and military aircrafts is driving the market growth. The rise in aircraft deliveries coupled with the declining cost of a composite material is further fueling the market growth. The growing demand for lightweight insulation materials is again boosting the demand for aircraft insulation materials. On the flip side, an issue regarding low shelf life and recyclability of composites is likely to hamper the market growth. This detailed market study is centered on the data obtained from multiple sources and is analyzed using numerous tools including porter’s five forces analysis, market attractiveness analysis and value chain analysis. These tools are employed to gain insights of the potential value of the market facilitating the business strategists with the latest growth opportunities. Additionally, these tools also provide a detailed analysis of each application/product segment in the global market of aircraft insulation material. The broad aircraft insulation material market has been sub-grouped into product and application. The report studies these subsets with respect to the geographical segmentation. The strategists can gain a detailed insight and devise appropriate strategies to target specific market. This detail will lead to a focused approach leading to identification of better opportunities. Furthermore, the report comprises of the geographical segmentation, which mainly focuses on current and forecast demand for aircraft insulation material in North America, Europe, Asia Pacific, Latin America, and Middle East & Africa. The report further focuses on demand for individual application segments in all the regions. The report also covers detailed competitive landscape including company profiles of key players operating in the global market. The key players in the aircraft insulation material market include BASF SE, Dupont, Esterline Technologies Corporation, Evonik Industries, Rogers Corporation, Triumph Group Inc., Zodiac Aerospace and Zotefoams. An in-depth view of the competitive outlook includes future capacities, key mergers & acquisitions, financial overview, partnerships, collaborations, new product launches, new product developments and other developments with information in terms of H.Q.